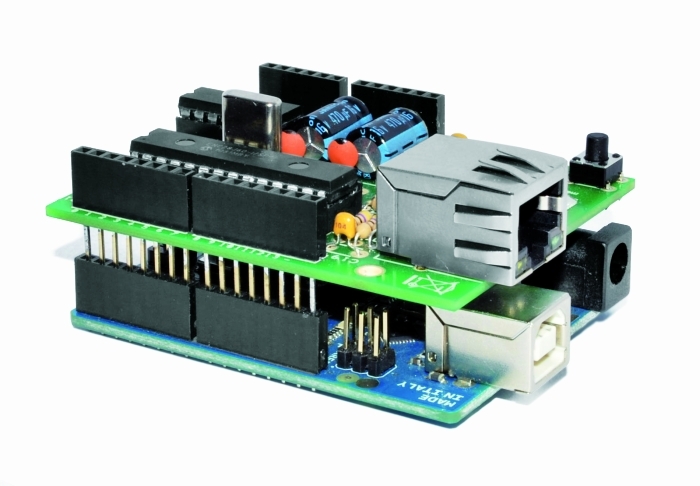 This ethernet shield is low-cost thanks to components used: all traditional mounting (THT). This feature makes the circuit accessible to those who haven’t the equipment to assemble SMD components. The data-rate is limited to 10 Mbps. The shield is based on a Microchip ENC28J60 chip that interfaces with Arduino and data conversion according to the ethernet protocol. It integrates the MAC controller, an 8 KB Transmit / Receive Packet Dual Port Buffer and a circular FIFO managed at the hardware level, allows the programming of data retransmission in case of collision. The MAC controller supports both Unicast, Multicast and Broadcast packets, has a programmable 64-byte pattern within a margin allowed to the user and programmable wake-up on multiple packet formats (Magic Packet, Unicast, Multicast, Broadcast, specific packet match or any packet). In the circuit we see that over all’ENC28J60 there are a standard RJ45 jack with integrated LEDs, filters and line transformers, and a voltage level shifter for the SPI interface to communicate with the Arduino. MISO is the output data of the slave device and the input of Arduino, while MOSI is the opposite; SCK is the clock that marks the two-way communication on the SPI bus and RESET the reset line, which is also connected to a button that allows you to reset the Ethernet interface, if necessary, manually. The digital D10 and D2 lines of Arduino are used, respectively, for the control of CS (Chip Select, active logic zero) and the reading of INT. U3B is used to adapt the logic levels 0/3, 3 V to those of Arduino 0/5 V.
The ENC28J60 operates with a clock of 25 MHz, defined by the quartz Q1 connected between the pins 23 and 24; the capacitor connected to pin VCAP filters the output voltage (2.5 V) of the internal controller and should preferably be of the type low ESR (low series resistance parasite). The resistor connected to RBIAS is used to bias the LAN transceiver that is part of the pin TPIN + / – and TPOUT + / -. We conclude the analysis of the circuit diagram of the shield with the power that is drawn by Arduino 5V and Vin through the strip: the first provides the 5 volts continuous stabilized points of the circuit that require them (basically the 74HC125 and the resistance of pull Line-up reset and Chip Select) and the second give power to the integrated regulator U2, which creates the 3.3 volts needed to power the microcontroller and circuits contained in the RJ45 jack. The original library from which we derived can be downloaded from the site https://github.com/jcw/ethercard ; from our site you can download the library itself but with a higher number of application examples. Here you will find a sketch example to build a Web Server, in particular, in the current web page you will see the hours: minutes: seconds elapsed from the ignition of Arduino. This will really help in controlling stuff from internet like wireless ac/dc switches. Are you willing to share the eagle/kicad files? I’m sorry but I haven’t the Eagle file. If it’s fine for you I can share the gerber file of course. Is there a parts list you’d share with us? I’d really like to try and make my own. Sorry I forgot the BOM. Thanks for the gerbers, what CAD package did you use to design it? ny chance of sharing the source files? I used Easy PC (number One system). It isn’t a free sfw. I can share the source without problem. Do you can open it? 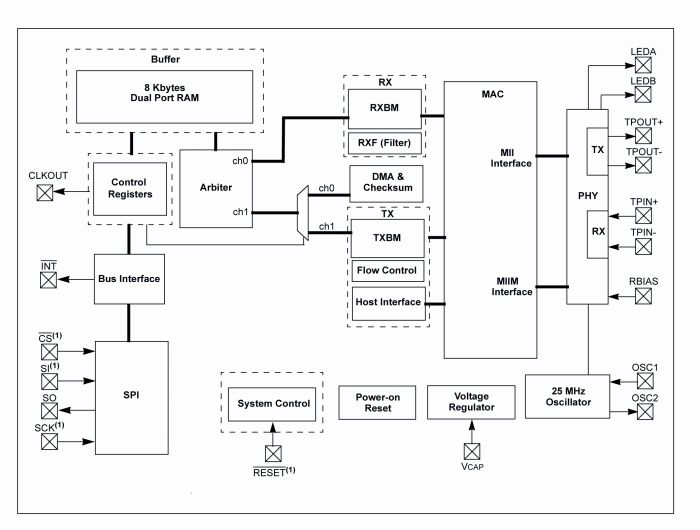 Why we need the 3.3 voltage regulator? for arduino old versions? the arduino uno already have 3v3. I’m very interested in build this, I’ll do it on my vacations. I’ve managed to put one of these together on a breadboard but I’m finding the connection is quite sporadic. Running ping continuously from Windows gives about 50% packet loss, with the packets that are returned usually coming in small groups (2-3 packets). Might you have any guesses at where the problem could be? 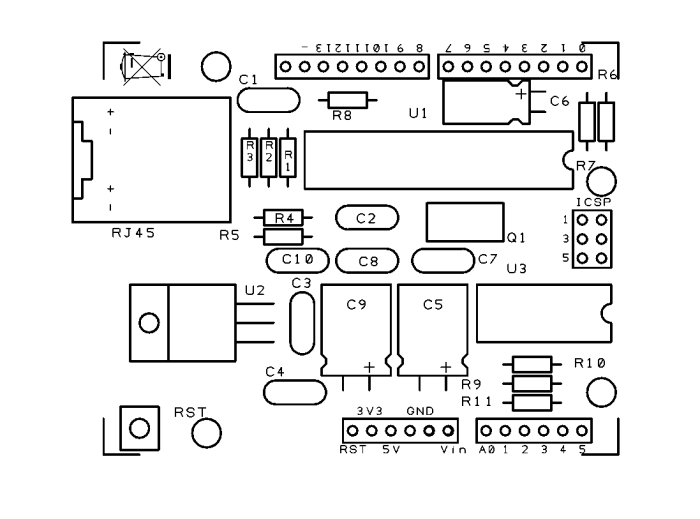 The major difference between my board and your diagram is the RJ45 port, mine is a Stewart SI-60002-F (http://goo.gl/Q1ExQ) and I’ve only wired TPIN+/- and TPOUT+/- to pins 1/3 and 4/6 on the jack respectively, all other contacts are open. 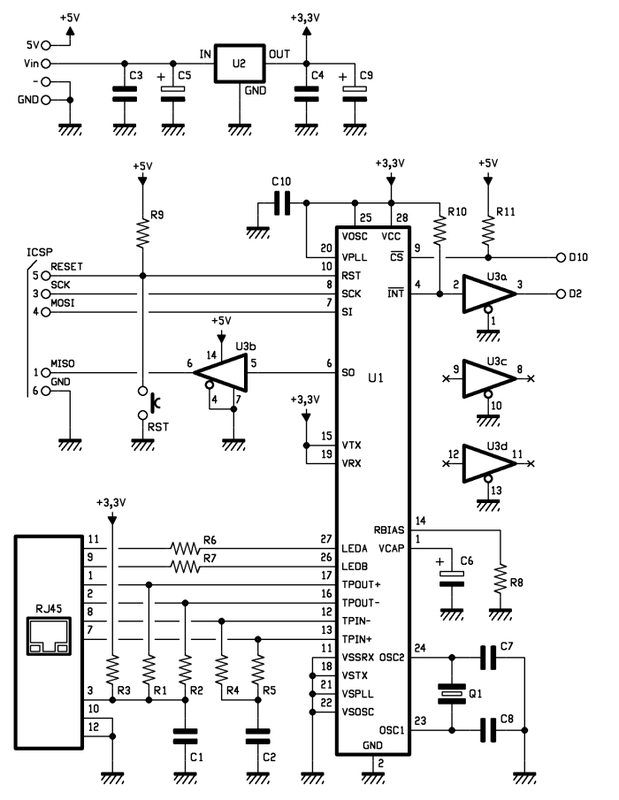 The other difference is that I’ve used a complete oscillator unit instead of a crystal, but the controller datasheet claims this is ok. Any help would be greatly appreciated, I’m new to all this! I believe I’ve fixed the issue – resoldered my connector with shorter wires … think I might have been subject to signal degradation due to transmission on untwisted pairs. Good news, probaly using a breadboard you find this problem. Is it work with Mega??? when I am running it. Nothing happens after that point. Any ideas? Having trouble finding RJ45 that fits the dimensions for this pcb. Can anyone give me a serial number for an RJ45 that fits? 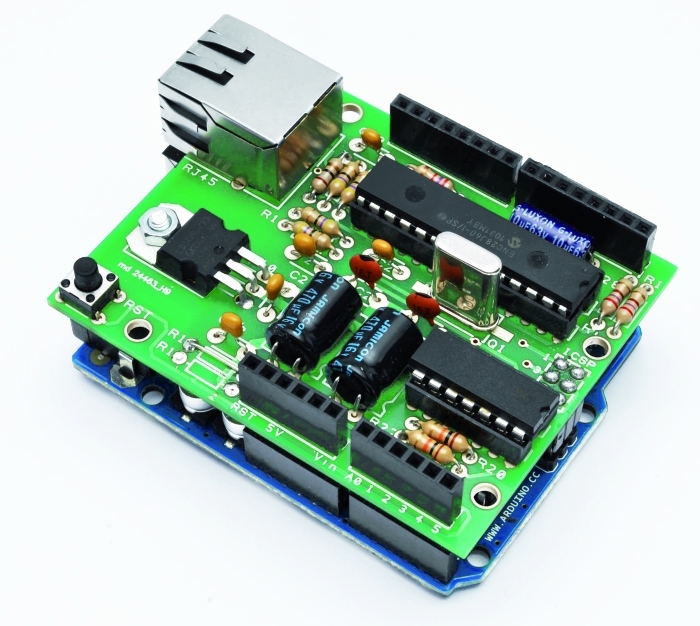 — Is it possible to use the Arduino Ethernet library directly? — Whats more or less the price diference? There is a link for the library. The library is not the same of the original Arduino ethernet shield. Am I right that it is online possible to run this shield if you power it over the power connector? USB only isn’t possible, is it? Ah ok. Thanks. Is it possible that I power the Arduino with 5V? So the shield also get’s 5V? Ok. Will power the arduino and shield with 12V. Hope it’ll be suitable for both. Hmm, 3.3V is needed for ENC and RJ45, here you are using LD1086-V33 witch is 1.5A, but it shouldn’t be problem to use LD111V33 witch is only 800mA, or I am wrong? I am trying to make my first electronic card. I have dowloaded the two copper layer (bottom and top) I have made the card, and I am about to solder the components. I noticed that some copper paths are positionned just under the RJ45 connector! So my question is, how am I supposed to solder? Normaly you hate to use a two layer PCB, with vias. perhaps someone has an eagle file of this project? Hi everyone, i made the schematic but i can’t make it work properly, any help please…. Can you please send me the picture of a bare pcb please, both sides? can I get the bare pcb from you? Can someone confirm me that all the components have to be soldered on the face where “8955” is written on the pcb? Hi Boris, great job with the design. 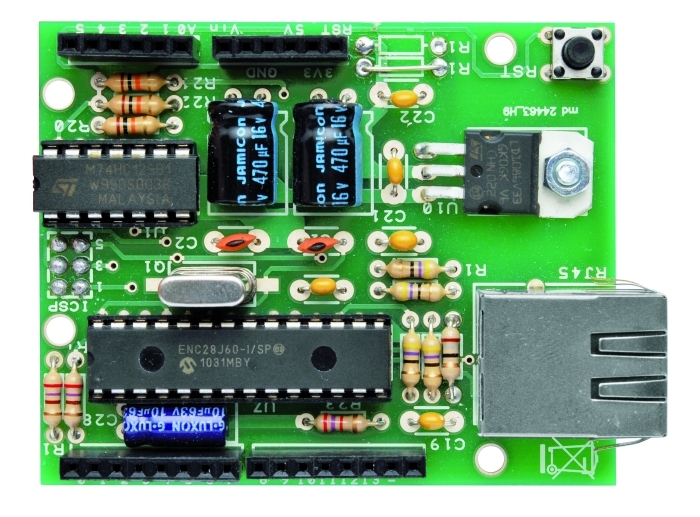 Can you please elaborate on the role of the 74HC125 in the board since it does not appear in the schematic? if I understand correctly it is used to isolate the SPI lines from the arduino instead of an optocoupler? Is there a sequence of command/reads that would indicate if the ENC28J60 is running and ready? The RJ45 jack shows the green light on, and the orange light blinks whenever the connected pc tries to ping it or request a web page from it. However, it always times out (the micro never sees the request)… So not sure if it’s the host not configured correctly (crossover cable, static ip) or if it’s the micro software (tcp/ip stack, static ip, spi) or if it’s the jumper wires (spi, power) going to the ENC module. With the logic analyzer, the SPI communication seems reasonable, that is, nCS goes low followed by 8 SCLKS (1Mhz), and then the expected transmitted data that the micro sends. The ENC does often respond with non-zero data. The SPI mode is 0 (CPOL=CPHA=0 ; Data sampled on Rising edge). Any suggestions how to see if the enc28j60 chip is working properly? Are there differences between the RJ45 components? Which one can you recommend?